In Berlin, thousands of taxis travers blocked streets and assembled behind Brandenburg Gate on Wednesday. By doing so, they protested against the new competition they are facing, and the latest plans of Germany’s Ministry of Transport. Around Tegel Airport, no vehicles could pass due to a taxi blockade. Passengers tried to walk to the airport. Because of the protest, a lot of traffic accumulated in several areas in the city. Some public transport systems, such as the U-Bahn trains, were crowded even between rush hours. Countless Berlin residents, including expatriates, were affected. In a forum for Spanish expats in Berlin, a member said, the “f*cking taxi drivers” were “on strike” and did not let anyone through. He was not the only angered person in the city. At Brandenburg Gate, countless taxis drove up and down ‘Straße des 17. Juni’, honking their horns. Officials held speeches. Their man concern are plans announced by Transport Minister Andreas Scheuer. He intends to create a legal framework which lets “platform-based and digitally brokered transport services” operate. This means Uber and similar services might not be restricted anymore soon. Scheuer, a conservative from Bavaria, also intends to make sure “the taxi and rental car business can profit from regulatory relief” and strengthen on-demand transport services such as driving pools and on-demand-buses, by removing obstacles in existing regulations. So far, Uber vehicles need to go back to their base by law after transporting a passenger, while taxis do not. Uber is not the only company of its kind anymore. There is even more competition for the 8200 taxis which offer their services in Berlin. The city’s main public transport provider is working on building a huge network of share taxis rides with which are lower than taxi rates. 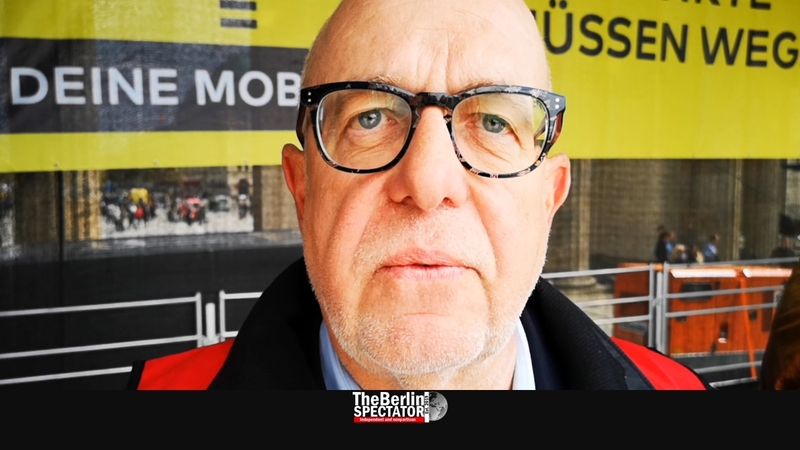 Thomas Grätz, chairman of the German Taxi and Rental Car Association (‘Deutscher Taxi- und Mietwagenverband e.V’), told The Berlin Spectator, the implementation of Minister Scheuer’s plans would “squash” the taxi business. In several other German cities, taxi drivers demonstrated against Scheuer’s plans as well.